Open Saturday and Sunday, 9 am to 6 pm. Hopelink food drive this weekend. If you have time, pick some additional berries for Hopelink. Any berries you pick we'll donate to Hopelink, no charge to you (you have donated your time!). We'll deliver the berries and any cash donations to Hopelink on Monday morning. Our sunflowers are starting to open. 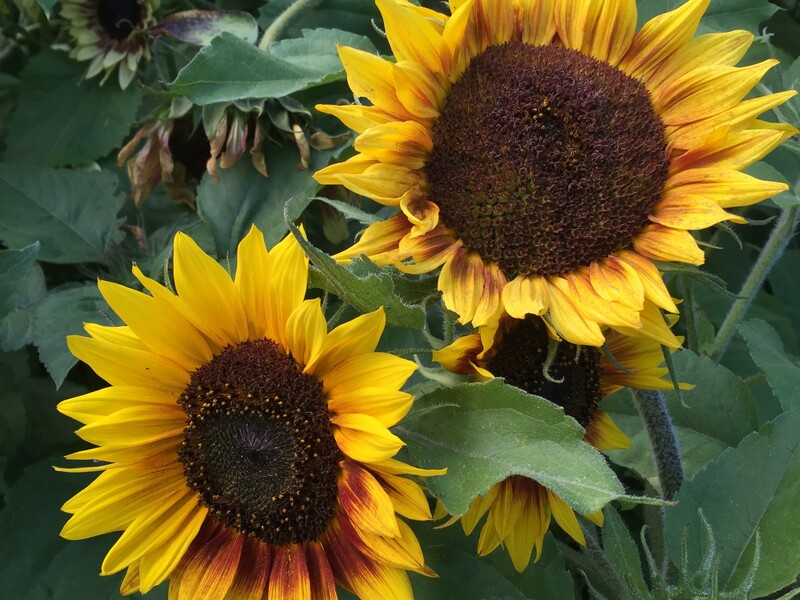 We expect to open the u-cut sunflower garden next week. We often get asked, "Do we spray anything on the berries?" We do not spray herbicides or pesticides on or the bushes. For example, in the front field, we pull weeds by hand from the base of the bushes and use mulch to help control weeds. And, the lack of pesticides means you may see a few "critters" such as baby slugs and spiders in your box. We do, however, spray a fungicide for mummy berry in the spring. The spray lasts 24 hours and we must do this before the bushes flower. So, the berries are perfectly clean and safe to eat off the bush. We are working to improve the health of the farm with the goal of being certified organic in 5-6 years. The process takes 3 years once you ask to be certified. However, both fields need to be pruned and mulched before we can begin the process. I'll keep you posted on our journey to certification.